Highly visible end cap in the Safeway anchored grocery center off of Nord Ave/Hwy 32. Location is currently a Subway and has a new grease trap. High foot and vehicle traffic! Zoned CC (Community Commercial) which offers a wide range of retail, restaurant, office or personal services uses. NNN lease estimated at $0.59/SF/Month. Quality Retail locations available at Country & Towne Center. Located next to Bootbarn, Rayley's, and other premium retail vendors. Two units are available. Each 1800 SF. Call for more Information! For Sale - For Lease - One of the largest commercial portfolio properties to come on the market in quite some time. Automotive Dealership property on three parcels totaling five acres close to the prime intersection of East & Cohasset. Zoned Regional Commercial allowing for a wide range of retail and commercial uses and even mixed use residential. For Sale - Classic American Drive-In. This is a great opportunity on so many levels. Hard Corner, huge traffic counts and vehicle stacking right in front of your business with 29,000 vehicles per day AADT. Two lots on .47 Acres. Fully equiped and operating 1,303 sq. ft. restaurant. Leased! Next to Rite Aid - 10,000 Sq. Ft. Leased! 10,000 Sq. Ft. Junior Anchor Space in Towne & Country Shopping Center on Chico's growing north side. Anchored by Rite Aid and Save Mart Grocery. Good Tenant Mix. Read more about Leased! Next to Rite Aid - 10,000 Sq. Ft.
Sold! For Sale - For Lease - 31,000+ cars per day. Absolute best available real estate in Chico, across from Starbucks and Raley's/Ross anchored Skypark Plaza Shopping Center. Possible Drive Thru Location - See renderings below. Primary shopping hub and cross roads location for the region. Other neighboring businesses and entities include Home Depot, TJ Max, Burger King, Butte College, McDonalds, Dollar Tree, Arby's, Les Schwab Tires, Americas Tires and many more. Former Western Dental location with 3,852 sq. ft.
Gateway to Downtown Chico and University. One of the best and only high quality corner pad location in all of Chico in Mangrove Plaza in the heart of central shopping district. Great location and high traffic. 22,000+ AADT Traffic. Good solid shopping center across from McDonalds. Available as a Ground Lease or Build to Suit. .45 Acres with plenty of cross parking under same ownership with no restrictions. Currently an existing former bank building now vacant. 9.6 ACRES ZONED Community Commercial (CC) Located near Bruce Road and Highway 32. The south east sector of Chico is approved for development. This parcel is part of a the Oak Valley development planned for ~1,300 living units. Community Commercial zoning is appropriate for a wide range of retail businesses. It also accommodates mixed-use developments with residential uses above the ground floor with a maximum density of 22 units per acre. Three Units Next to Ross available! 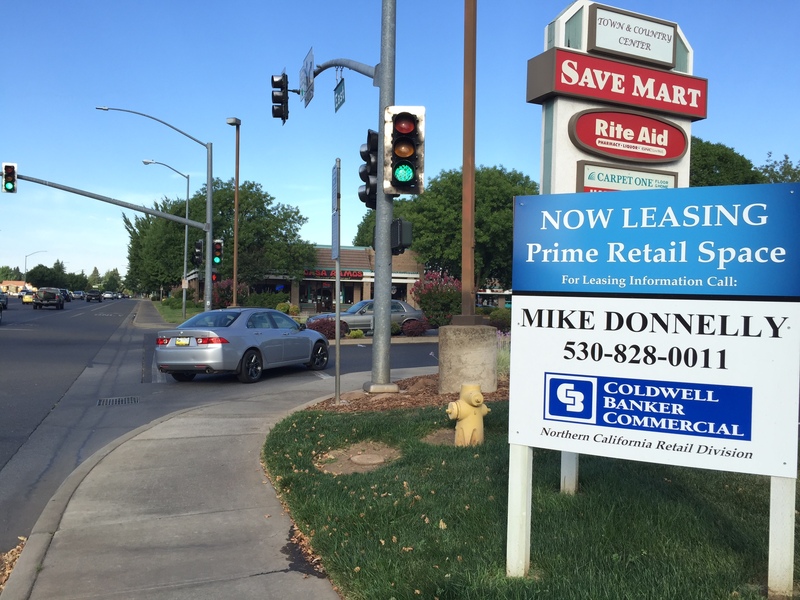 Excellent high traffic location in one of Chico's most profitable shopping centers. Huge traffic counts and regional retail consumer draw. Anchors include Raleys, JoAnne Fabrics, and Dollar Tree. New remodel and new Starbucks adding even more value. Call for lease rates and additional details. Suite 190 - End cap location! Left side of Ross. 2,812 sq. ft.
Suite 210 on the right side of Ross - 2,971 sq. ft.
Suite 230 to the right of medical - 3,054 sq. ft.
Suite 240 on the far right side of Ross - 1,000 sq. ft.
Perhaps the most successful centers in Chico beautifully remodeled. $400 + average sales per square foot. Two opportunities: 1) Suite 400 between Cal Java and Tuesday Morning - 1,200 sq. ft. 2) Suite 260 in between the popular Cocodine Thai Restaurant and JoAnn Fabrics - 1,600 sq. ft.